Feelings: After slurping some hand pull noodles at Sheng Wang, the boys went to a happy hour for a few bevvies, and the girls and ALev searched for some luscious dessert in Lower East Side. I aimlessly looked for the new Japanese dessert cafe, Luxee, but none of us had an iPhone, so we couldn't figure out where it was located. iPhone seems to be a crucial necessity for aimless foodblogging. 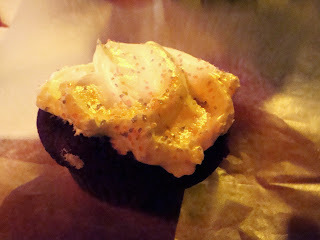 Eventually, JBH and MGru suggested Sugar Sweet Sunshine's cupcakes since they were open late. The interior of the bakery was very conventional and cozy, and the atmosphere reminded me a lot of laid back 90's coffee shop. I am not sure if that is a compliment, but I am a child of the 90's, so I enjoyed sitting on their couch comfortably with my good friends. I ordered Ooey Gooey, which was a chocolate cake with chocolate almond butter cream. To my surprise, it was only $1.50! 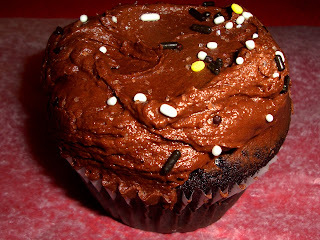 Shame on you, Magnolia, Cupcake Cafe, Crumbs, Buttercup, Babycakes and the rest of cupcake army of Manhattan. If they can make such a scrumptious, fluffy cupcake with creamy frosting heaven at a low price of $1.50, you should be able to do the same! After meeting up with the boys, we finished up the night at the Dressing Room, which is my version of heaven: a vintage and local designer boutique with a cocktail bar and projection of obscure Italian cinema. Who knew I could shop and try on dresses while my friends enjoyed their $3 Miller High Lifes? I agree. I was shocked the cost was so low and the goods amazingly tasty. For shame on Crumbs indeed. The Dressing Room sounds divine. I'm going to have to build Thurmon's tolerance for alcohol next time so we can join you. hey, i don't drink! but i sure shopped at the dressing room and watched movies. Shopping and watching movies...even better to have those options along with libation! Must see this place.